02:00:00 Makes 21 servings, 2 cookie balls (42 g) each. 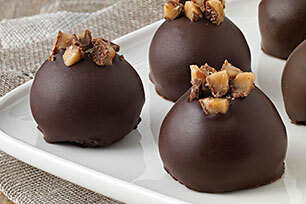 If you like our Chocolate Chip Cookie Balls, you're going to love our Toffee Cookie Balls! These cookie balls have the added bonus of chocolate-covered toffee bar bits, along with chocolate chip cookies, cream cheese and semi-sweet chocolate. For a change of pace, try our Peanut Butter Cookie Balls or OREO Cookie Balls. Substitute 2-2/3 pkg. (6 squares each) Baker's Premium 70% Cacao Dark Chocolate (16 squares) for the semi-sweet chocolate. Sweets can add enjoyment to a balanced diet, but choose an appropriate portion. Stir chopped nuts into remaining melted chocolate; spread onto parchment- or waxed paper-covered baking sheet. Refrigerate until firm. Break into pieces. Store in tightly covered container in refrigerator. Serving Size Makes 21 servings, 2 cookie balls (42 g) each.